Because this card was found with a collection of Maine calling cards from Franklin, Penobscot and Somerset Counties, it's possible that this card belonged to the Arthur Calvin Dinsmore born at Bingham, Maine, in 1852. 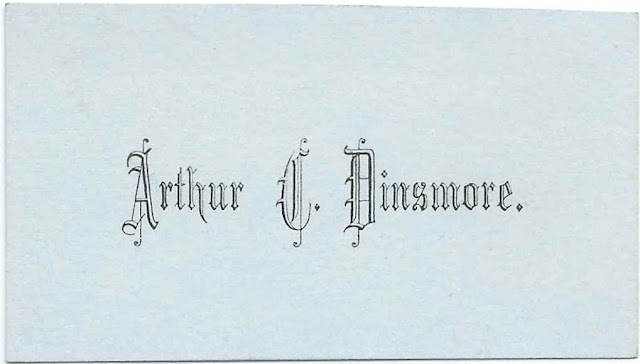 Arthur Calvin Dinsmore was born March 6, 1852 at Bingham, Maine, the son of Abner Dinsmore and Julia (Getchell) Dinsmore. On March 6, 1877 at Solon, Maine, Arthur married Alice A. Baker, who was, I think, the daughter of Ephraim and Mehitable Baker. The 1880 Census of Bingham, Maine, shows that Arthur was working as a boot maker and that he had Alice had two children, Lephe and Arland. By 1900, Lephe had married James Church Gregory and was out of her parents' household. Arthur's occupation was shown as undertaking. Arland, or "Arlie", married Daisy Edith Knowlton in 1909 and was out of his parents' household by the time of the 1910 Census of Bingham, Maine; Arthur's occupation was again shown as boot maker. By 1920 his occupation was again listed as undertaking, so I assume he did both occupations as circumstances allowed. Arthur died in 1925 and Alice in 1931; they're buried in the Bingham Village Cemetery at Bingham, Maine.